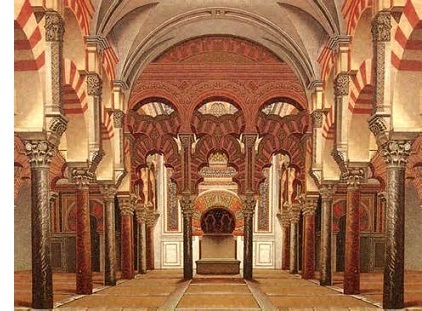 Córdoba Mosque - The Great Mosque of Córdoba (simply La Mezquita in Spanish) was originally the Visigothic church of St. Vincent. But after the Muslim conquest of Spain, Córdoba became the Umayyad capital and the church was re-built in 785 and converted into a mosque. Located in Andalusia in Southern Spain, it represents some of the finest Moorish architecture on earth. The central floor has an area of 23,400 m² and the roof is supported by 856 columns. After the Reconquista by the Spanish over the next 800 years, it was converted back into a church (it's a Catholic cathedral) which it remains to this day.